So, what to do? Oatmeal is a great solution to my healthy breakfast dilemma. It is whole grain, no sugar added, and four grams of fiber per serving. There is instant oatmeal, of course, but it doesn't taste as good as old fashioned rolled oats, or steel cut oats. Also, many of the packets have added sugar and flavors that may or may not be delicious. And, it costs more per serving than a regular box of rolled oats. The solution: Buy a slow cooker and mix your oats and water at night. In the morning, your oats are ready to go! It is SO ridiculously easy and (for you college students out there), you don't even NEED a stove. Get your hands on some rolled oats or steel cut oats from the bulk section of your supermarket. They are cheaper and more delicious than Quaker (trust me, I have tried them all). Use a small slow cooker (1.5 - 2.5 quart). I used my large one and it really made a mess to clean up. Picture crusty oatmeal glued to my cooker. The small ones are perfect for this task. Change what you mix in to your oatmeal. You can get bored with oatmeal if you eat the same thing every day. Add different things and look forward to the meal. 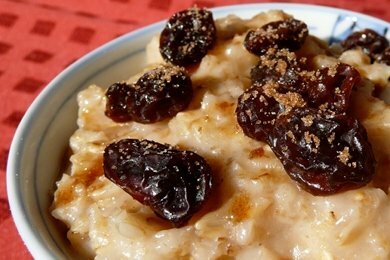 I love crockpot oatmeal, it's one of my favorites! It's so creamy and dreamy!! Will have to get a small crockpot. My friend uses one (1.5 qt)to melt chocolate for dipping her pretzel sticks that she makes at Christmas time. I use my rice cooker. I put the oats & water (1:2 ratio) and a touch of salt in the cooker at the same time I make my morning cup of coffee, and by the time I get ready for the day....breakfast is ready. Easy clean up too. If you don't have a small crockpot, you can spray it with cooking spray before adding your ingredients. This really helps with the steel cut oats by keeping them from getting glued to the pot. I just got a recipe a few weeks ago for this and have already made oatmeal got the week twice! I grind up rolled wholegrain oats in a blender ahead of time, then mix about 1/4 cup with 1/2 cup almond milk, and cook in the microwave on 50% power for 2 minutes. You can add berries, rasins, etc. I also throw on a tablespoon of ground flax seed. Super fast and easy. Cocoa powder and 1 Tablespoon of peanut butter is great to throw in oatmeal! It's like eating cookies for breakfast! Eating oatmeal as I read this! I haven't tried crock pot version, but use the microwave with old fashioned oats all the time. Today's favorite: Slice a banana in a bowl. Add 1/2 c. rolled oats, add about 2/3 c. skim milk, sprinkle with cinnamon. Cook in microwave for about 2 min 20 sec, and sprinkle with a couple of those yummy sugar-glazed pecans. Really filling & about 6 WW points (and includes milk serving). The only trick is to use a deep bowl, as this bubbles up a bit while cooking. So simple! I ve never thought of that, I think I will try it with apple chunks! I have a question...maybe I missed it in the post, but in the recipe, by letting it set, do you mean on low? Thanks in advance! I use a wide mouth thermos to make an individual portion overnight. 1/4 cup steel cut oats, dried fruit (so they plump up overnight), 1 cup boiling water. That's it. Next morning I throw it into a bowl and if it's not hot enough I nuke it for a minute and then add my other toppings. Voila! This morning it was craisins, brown sugar, walnuts, and cinnamon. Awesome idea Jennifer - thanks for the tip about making oatmeal in a thermos. I'm going to try it tonight! i use the slow cooker liners and it makes clean up SO easy! there is never a nasty crust on my crock pot that i have to scrub off! Invest in slow cooker bags! They take care of the cleanup mess in your crockpot. Some folks rinse them out and reuse them. Some folks spray vegetable oil (misto sprayer) inside the crockpot to keep themess at a minimum. This just gave me an Easter basket idea for my young adult daughters! A small crock pot filled with this recipe, some oats, and maybe some nuts and dried fruit. Thank you! place in refrigerator 8-12 hours. The next morning, I dice an apple and a banana and stir the fruit into the oatmeal (I like cinnamon, so I add some more then, too). I microwave the entire bowl on 50% power for about five or six minutes (I use the low power so it doesn't explode on to the roof of the microwave), give it a stir, and yummmmmmmm. To keep from having to clean out my crock pot in the morning, I put my oats, water, and spices in a glass bowl inside my crock pot. Then I pour water into the crock pot around the glass bowl, which becomes an island of oatmeal deliciousness, and let it cook overnight on low. Once we've eaten the oatmeal, the bowl goes into the dishwasher. Like Maria above, I microwave rolled oats all the time. I use 1/2 c oats, 1 Tbs brown sugar, 1 mounded Tbs peanut butter, and a smidge less than 1 c water. Microwave for 1 min 15 seconds (or however long it takes in your microwave), and it's done! I make steel cut oats in my rice cooker, too! I set it up, turn it on and then walk my dogs. When I come home, it's hot and ready. I got a new larger rice cooker recently and now I do three days worth, and then microwave the left overs for the next two days. I always add cinnamon, apple, dried cranberries, dried mango... so delicious. I microwave my old fashioned oats with a bit of almonds milk for sweetness foot about 2 min 15 sec and I'm done. Throw on fruit and I have a great breakfast in minutes! Can you compare using quinoa to oats. I have been hearing about that a lot lately. And oatmeal just does not keep me full for a long time unless I use excessive toppings. With quinoa I can use left over plain and some toppings and heat it up quick. Can someone confirm for me that we will be cooking the oatmeal for nine hours? Or just letting it sit? I am confused. further, I have a small crockpot with two settings--low and high. I assume if I am cooking it I would do so on low? Looking forward to a response. Thanks! 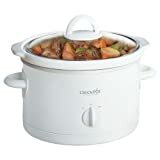 Can someone tell me if I should put the crockpot on low for 9 hours--the directions are not clear to me. Like Elizabeth said, I put my steel-cut oats + liquid in a greased glass loaf pan inside my large oval crockpot and then pour water up to about the half-way point on the loaf pan for overnight oats with little clean up. My favorite mix-in? Almond butter. Mmmm. That is fantastic! I never heard of doing it like that and I make 'healthy' oats at least 3 times a week. I'm getting the crockpot out tomorrow! Thanks Lisa...and don't forget to put in some Java Raiz raisins, the cinnamon or mocha coffee are my favorite! I'm going to try using Millet. I usually make my oatmail with milk. is it ok to use low fat or almond milk when making this in a crock pot? To answer questions above, yes, you are cooking oats and liquid, on low, for 8 to 9 hours. Hope this info. helps. I was actually glad to get out of bed on this Monday morning. I could smell the oatmeal cooking. How do you feel about the classic starbucks oatmeal? Its steel cut oats and they give you the individual packets of brown sugar, nuts, and fruit (dried raisins/currants). i usually used 1/2 of all three packets (100 cals each except the packet of brown sugar is 50 cals). Is this so bad? How much is serving? A cup? 1 cups? Thanks!